Today it is exactly two months until the start of our exhibition-residency at gallery Pleiku in Berlin. At the moment, all of our paintings are still ongoing. 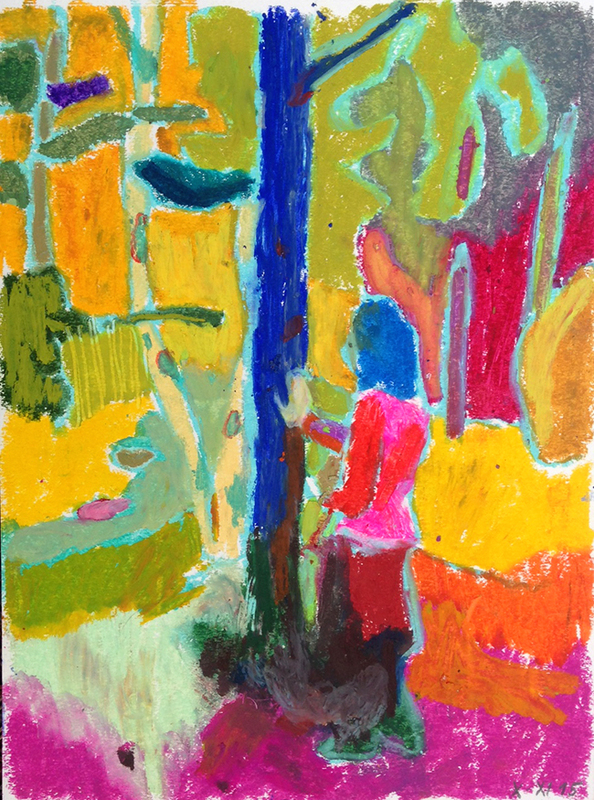 On Friday, yesterday and this morning we have been working on a painting, that depicts a figure resting their hand on the trunk of a tree. 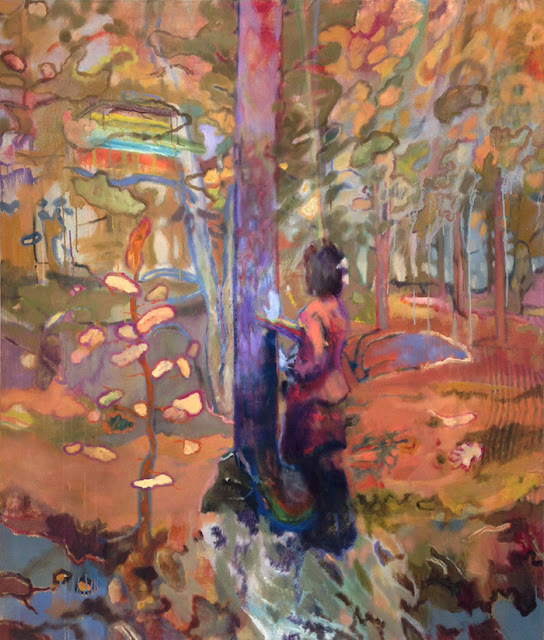 This painting whispers an ancient connection with trees. Trees are the source of much healing energy, inspiration and wisdom, when approached with respect, openness and sensitivity. Trees play a major part in our paintings and in our everyday life. Some rainbows have started appearing in most of our paintings. We spent the weekend minding Raisa's uncle's place in Pöntsö, galleria Raekallio. We took some canvases with us in order to stretch them, prime them, and get them ready for painting. We struggled big time putting a coat of rabbit skin glue! Rabbit skin glue is a traditional way of priming canvases based on actual animal parts. Everyone on the net seems to have their own recipe with their do's and don't's regarding its proper use. We went a bit nuts. 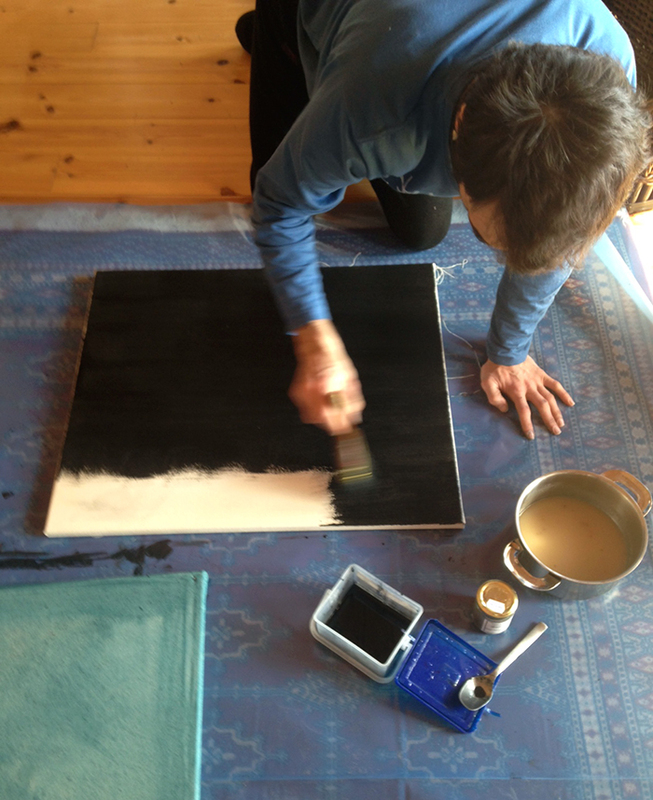 Below, Misha trying his best mixing the glue with black pigment to size a canvas. Sketch for the above painting.